Millions of people around the world have experienced sleeping in a hammock some time or another. Sleeping in a hammock is good for your health. Hammocks are your best camping buddy – they’ll let you sleep snuggly at night, even when you’re away from your bed. And they might even replace it one day! What’s better than falling asleep, slowly swaying under the warm and starry sky. Even scientific studies are proving that sleeping in a hammock is good for your health. Hanging in a hammock allows you to fall asleep faster. The swaying motion relaxes the body and actually simulates the rocking we experienced as babies. The slow back and forth is just like mom rocking us to sleep. This motion is so effective it can even be used to cure insomnia. Try not relaxing while laying down in a hammock! Not only can hammocks put you to sleep quicker, it can put you into deeper sleep – which in turn helps rejuvenate your body for tomorrow’s journey. To get a bit geeky – the rocking increases the length of your N2 sleep. This type of sleep is non-REM sleep that contributes to half of a good night’s rest. Scientists have also discovered that the rocking motion increases sleep spindles. Sleep spindles are bursts of brain activity. They’re linked with remembering more information and helping your brain rewire when it’s resting. 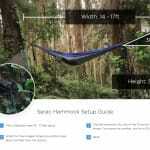 If you’re trying to memorize some new information, try taking a nap in a swaying hammock! 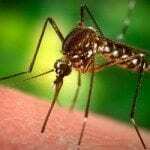 While on a camping trip, sleeping on the ground or even a mattress can be uncomfortable. Sleeping on uneven, rough or bumpy surfaces causes us to toss and turn throughout the night. The bumps and unevenness cause us to sleep excessively on certain parts of our body, causing pressure points and potential pains in the morning. Hammocks are helpful while camping as they keep you above the rough surfaces, unlike the troubles you’ll face sleeping in a tent. No more hassles of setting up a tent. No more fumbling around with poles, stakes, knots. Hammocks can be set up in just a minute. Just throw on a set of tree straps around trees, clip the carabiners in and you’re good to go. Hanging in a tarp covered hammock during rain gives you the advantage of a waterproof environment. In a tent, you’ll still have to stress about the slope of terrain as well as muddy, wet ground. To enjoy maximum comfort in your hammock it is important to choose the right kind of hammock, according to your body size and preference. 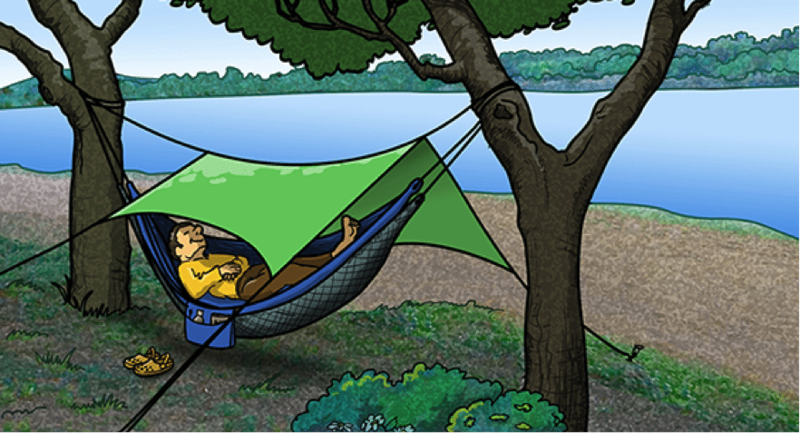 Lying in a diagonal position will give you more comfort while sleeping in a hammock. A little bit of research should be done first on a hammock suitable for you and you’ll be dozing off in comfort in no time. Hammocks provide complete air circulation, providing comfort even during hot days. While tents trap heat in them, nylon and most hammocks are highly ventilated. They circulate fresh air making sleeping in them very refreshing. Apart from all of the benefits mentioned above, there are some other advantages that a hammock provides. They are easy to setup and are very lightweight making your backpacking experience a lighter one. They also give you complete exposure to scenic beauty around the camp site. Hanging above the ground saves you from attack of creeping insects. No more stressing over searching for an even and dry campsite. Hang it anywhere and within minutes you have your bed ready for relaxation. To completely enjoy the sleeping experience in a hammock, make sure that you purchase the right kind of hammock and that your sleeping posture is correct. 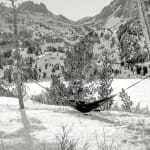 This entry was posted in Hammock Benefits and tagged Backpacking, benefits, Camping, hammock, tips.